IPL treatments are an ideal skin rejuvenation treatment for patients with active lifestyle because the procedure requires minimal downtime and has low risk of side effects. Three pre-set modes tailor the wavelength spectrum, pulse width, and cooling to optimize treatments for superior clinical outcomes. Large spot size results in fast, effective treatments. Increased precision effectively decreases the number of treatments required. Effective on the face, chest, arms and hands- virtually anywhere where sun damage shows. 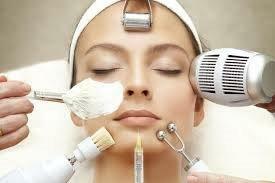 How does Intense Pulsed Light Photo Facial work? A broad spectrum of light is transmitted through a small, smooth, transparent handpiece which is gently placed over the skin. Cut-off filters in the handpiece change the wavelength range allowing it to be optimized for different applications and skin types. The light penetrates the tissue and is absorbed by either the blood when treating vascular lesions or the melanin when treating pigmented lesions and damages them. The body’s natural processes then remove the injured tissue giving the skin a more even and youthful appearance.